Ear deformities may develop secondary to congenital malformation, trauma, keloid formation or skin cancer. Ear reconstruction is a formidable challenge due to the unique anatomy of the ear, which is comprised of finely shaped cartilage and thin skin in the upper ear, and delicate soft tissue in the lobule. Recreation of the delicate ear contours requires anatomic knowledge, surgical skill and artistic ability. Dr. Khosh is skilled in reconstruction of ear deformity from any cause, from torn ear lobes to missing auricles. 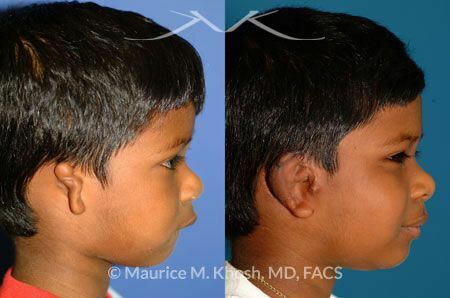 In congenitally absent ears, Dr. Khosh uses rib cartilage to recreate a natural appearing ear; this type of ear surgery is known as microtia repair. 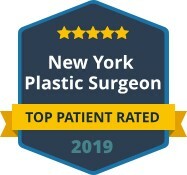 In wrestlers or boxers who develop collapsed or misshaped ears, Dr. Khosh uses cartilage shaving and grafting techniques to restore the normal contours. Patients who develop keloid deformity of the ear can be helped with excision of keloid and meticulous repair. Ear reconstruction following skin cancer removal (Mohs surgery) is tailored to the particular defect. 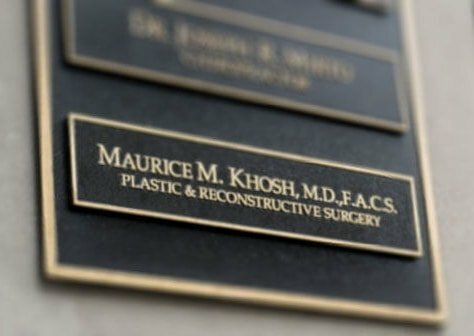 Dr. Khosh relies on his armamentarium of reconstructive techniques to achieve the most satisfying outcome. Contact our office today to schedule an appointment for your or a family member. We look forward to serving you! This 5-year-old boy had congenital under development of his ear, known as microtia. His ear was reconstructed with cartilage taken from his rib. What kind anesthesia is used during ear reconstruction? Uncomplicated ear reconstructions such as repair of torn ear lobes, excision of keloids, or repair of small cancer defects can be comfortably performed under local anesthesia. More complicated ear reconstructions require sedation or general anesthesia. How long is the recovery from ear reconstruction? Most patients can return to work within 10 days of ear reconstruction. Individuals who undergo simple office treatments such as repair of a torn ear lobe may return to full activities within a day. Patients undergoing more complicated ear reconstruction will experience swelling and bruising which may last ten days. When can I re-pierce my ear after repair of a torn ear lobe? We recommend waiting 6 weeks or more after repair of a torn earlobe before re-piercing. What is a wrestler's ear deformity? A wrestler’s ear deformity or cauliflower ear describes collapse and deformation of the upper cartilaginous aspect of the ear. The underlying cause of the deformity is a reoccurring collection of fluid between the ear cartilage and overlying skin that eventually leads to loss of cartilage and collapse. What is the treatment for wrestler's ear or cauliflower deformity? Minimizing trauma to the ears will reduce the incidence of fluid collection, which is thought to contribute to this problem. When fluid collection is present, timely drainage will minimize cartilage trauma. Reconstruction of cauliflower ear deformity entails cartilage grafts and skin flaps. How can you reconstruct a missing ear? A missing ear that results from congenital absence or trauma may be reconstructed through a multi-staged operation. Structural support of the ear is fashioned from rib cartilage or an implant. The skin is fashioned from transfer of adjacent tissues and skin grafts. Reconstruction of the ear is occasionally a multi stage surgical effort to arrive at the maximum aesthetic results. 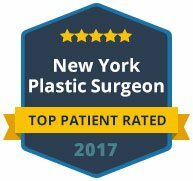 Skin grafts, tissue flaps, and cartilage grafts can be used to improve or augment the reconstructive effort. In the rare occasions that scalp skin is transferred to the ear, hair removal may be necessary as a related procedure.